High School Comedy Playhouse cast in rehearsal earlier this June. High School Comedy Playhouse will bring to life 186 of Hollywood’s greatest films in a fast-paced ninety minute production of “Completely Hollywood! (Abridged)” at Cutting Hall Performing Arts Center, 150 E. Wood Street, in Palatine. 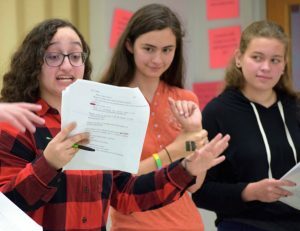 This Palatine Park District program was created to give high school students an opportunity to participate in a comedic play during the summer months. Performances will run from July 14 through July 23 with 7:00pm shows on Fridays and Saturdays, and a 3:00pm show on Sundays.